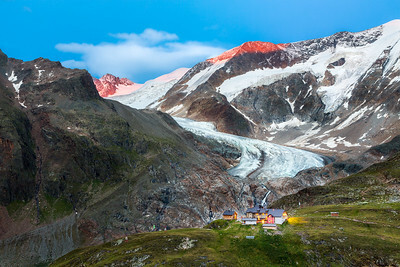 ID:17070129 / In the lower third portion of this image you can see the Taschachhaus, a mountain house that is located at an elevation of 2434m above sea level in the Pitztal, close to Mandarfen, Austria. It is used as training center for the DAV (German Alpine Club) among other alpine clubs. Various alpine and high alpine routes start from this mountain house. 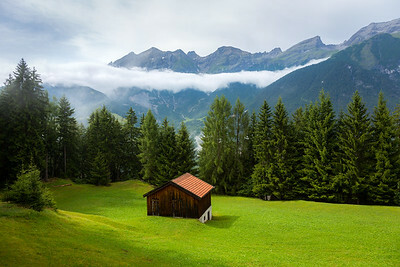 ID:17070172 / Small wooden sheds to dry and store hay as well as agricultural tools are quite common in Tirol and the alps in general. I found this hut just outside a small village located at approx. 1000m elevation. Just after a thunderstorm some low clouds passed in front of a mountain range in the background, making for a nice composition. ID:17070183 / The Kronburg castle is situated on a small hill of approx. 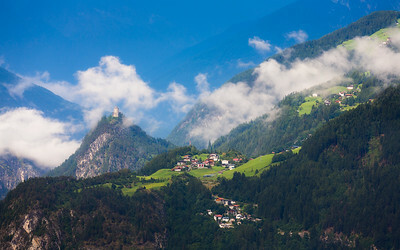 1000m elevation, located in the western part of Tirol. After a heavy thunderstorm had cleared the area, the humid air transformed the landscape into a magical scene.